Kate and I were both well and truly exhausted by the end of the tour. I don’t sleep that much at the best of times, but combined with lots of adventures, having a cold/flu like illness for the past week, I was feeling pretty exhausted. Kate was also lacking her fairly regular 10 hour sleep days, so we had a very lazy start to the day. That was OK though, as we had already spent 3 full days in Istanbul, and we had ticked off the major things we wanted to do. So our last 2 days here would be pretty relaxed. Today we decided to jump on a ferry ride on the Bosphorous for a couple of hours. 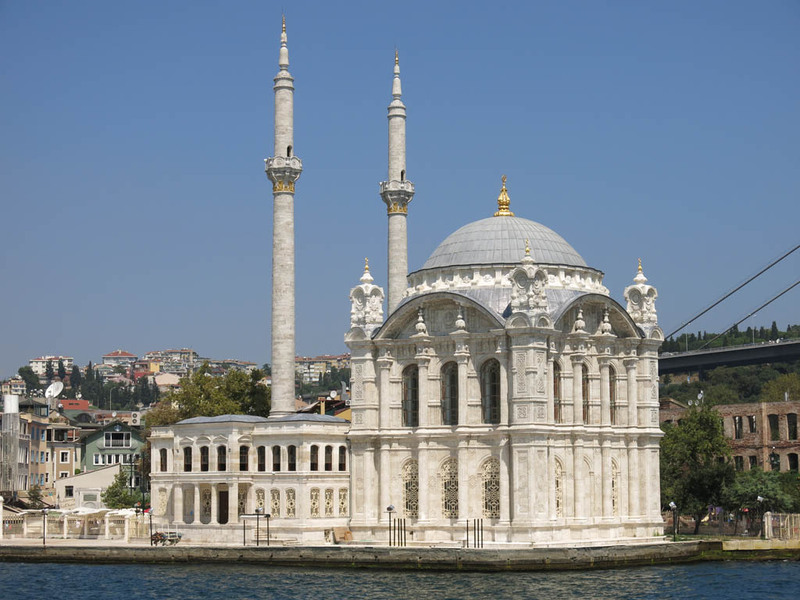 Istanbul is a remarkable city in that it is split amongst a number of bits of land separated by a few bodies of water. The Bosphorous is one, that leads to the Black Sea. So we decided to have a relaxing trip up the Bosphorous, not quite to the end. 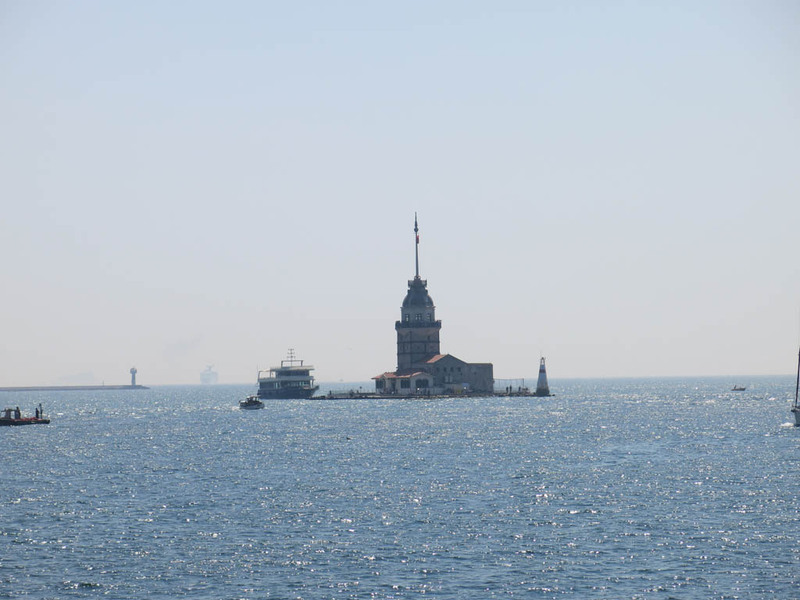 We just sat back and chilled out, seeing some more sites of Istanbul from the gentle ferry. There was no commentary or guide, so we had to rely on our trusty Lonely Planet to fill in some gaps. On the way we was landmarks like Dolmabache Palace, Ciragan Palace, and a number of Mosques. Talk about a picturesque place to worship. The turn around point was the Faith Bridge. 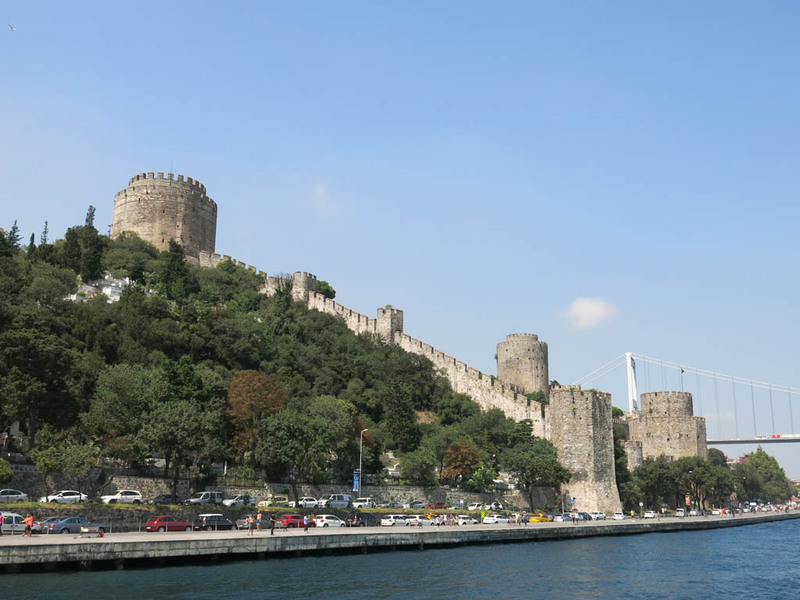 It is flanked by two small forts, the Rumeli Hisari and the Andalou Hisari. I guess just in case there is any influx of dodgy folk again. On the return we also saw a small lighthouse called Kiz Kulesi which according to our guidebook was in The World Is Not Enough. Seems Bond loves Istanbul. By this time we pulled back into dock and our trip was up. Kate and I just decided to spend the next few hours wandering about. We made our way back through the nearby Spice Market, not too tempted by all the tasty treats that lie within. Maybe it was Turkish fatigue setting in, that ordinarily I would be all over that sweet Turkish Delight, but right now was happy just to soak up all the atmosphere and leave the delight for another day. We also visited one of the small markets near the Blue Mosque for a peruse, where Kate found herself a very cool silver coffee pot that will look good in our place. Otherwise that was the extent of our day. After such a hectic last couple of weeks, a low key day was nice. We met up with some of the remaining folk from our tour (Bec, Cathy and Leesa) for a nice dinner, and said goodbye to one more member of our tour. With one final day to spend in Istanbul, I imagine it would be the same tomorrow… another relaxed day to soak up our last time in Istanbul and Turkey.